We had a great time last night at #shonalitweetup and yes, I will be posting photos from that event, but I’ve got just a few minutes before Arianna Huffington‘s keynote begins at PRSA2009. Very quickly, though, here are some of the cutest shoes I’ve seen at the conference so far. As I write this, I’m about two hours away from San Francisco en route to San Diego for PRSA09. 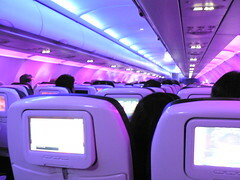 I’m on Virgin America’s Flight 67, which is my first time traveling with the airline.